With the new year come resolutions to get healthy, lose weight, join a gym, and also, endless advertisements for weight loss programs. In Purdue Agriculture, our researchers work year-round to enhance our health and fight disease. There are many examples across our college, but I’ll concentrate on just a few here that illustrate the Purdue 150th theme of “Giant Leaps in Health and Longevity”. Dr. Shihuan Kuang, Animal Sciences, focuses on how muscles develop and regenerate as well as the functions they play in communication. His research in muscle science has important implications for both the meat production industry and human health. Dr. Kuang recently discovered a novel signaling mechanism that regulates muscle stem cells. Stem cells are important for muscle maintenance and regeneration, especially under disease and aging conditions. Understanding the molecular regulation of stem cells can help researchers like Dr. Kuang improve the regeneration and function of skeletal muscles that are impacted by diseases such as muscular dystrophy as well as enhance muscle quality in meat animals. Dr. Andy Tao, Biochemistry, has developed new methods for detecting proteins that are activated by phosphorylation, a process that often turns a protein from a normal molecule to one that can cause cancer. Dr. Tao has developed new technologies to measure phosphorylated proteins that could lead to being able to detect breast cancer through a simple blood test or bladder cancer through a simple urine test. 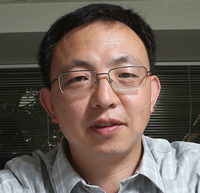 Dr. Tao and his former post-doctoral researcher, Dr. Anton Iliuk, used these important research discoveries to start a company, Tymora Analytical Operations, in the Purdue Research Park, and he won Purdue’s 2017 Outstanding Commercialization Award for making his research available to the public. Dr. Tao and his colleagues continue to develop more products and are working to use the same techniques to detect other cancers. 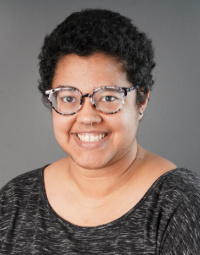 Dr. Catherine Hill, Entomology, is working to develop non-toxic, non-lethal pesticides to combat mosquitoes and other insects that carry diseases like West Nile, Dengue virus, Zika virus, Lyme Disease and yellow fever. Her goal is to control these insects and the diseases they carry in a way that is safe for humans and the environment and that does not eliminate the insect population, thus preserving biodiversity. Lyme Disease, carried by ticks, is a particular concern in Indiana, with more than 100 cases of the disease each year. In true land-grant fashion, Dr. Hill runs a Citizen Science Program, Tick Insiders, to teach high school-age students how to collect and identify ticks found throughout the state of Indiana and analyze them to determine what bacteria they are carrying. So far, the team of Citizen Scientists have found three types of ticks and identified hundreds of bacteria they carry. These three individuals are just a few of the outstanding scientists in the College of Agriculture whose work supplies the knowledge that will allow us to treat or prevent diseases in the future. Through basic research, commercialization and student training, these individuals are laying the foundation for “Giant Leaps” in improving health and longevity. The Graduate Research Spotlight highlights graduate students and their work. The January spotlight is on Carmen Wickware, Animal Sciences. 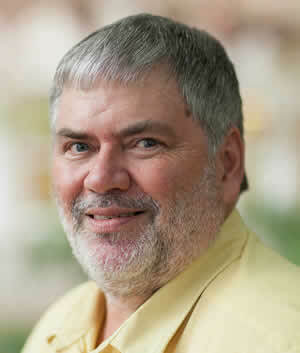 Bernie Engel, who led the Department of Agricultural and Biological Engineering (ABE) to recognition as having the top graduate and undergraduate ABE programs in the country, is the new associate dean of research and graduate education for the College of Agriculture. 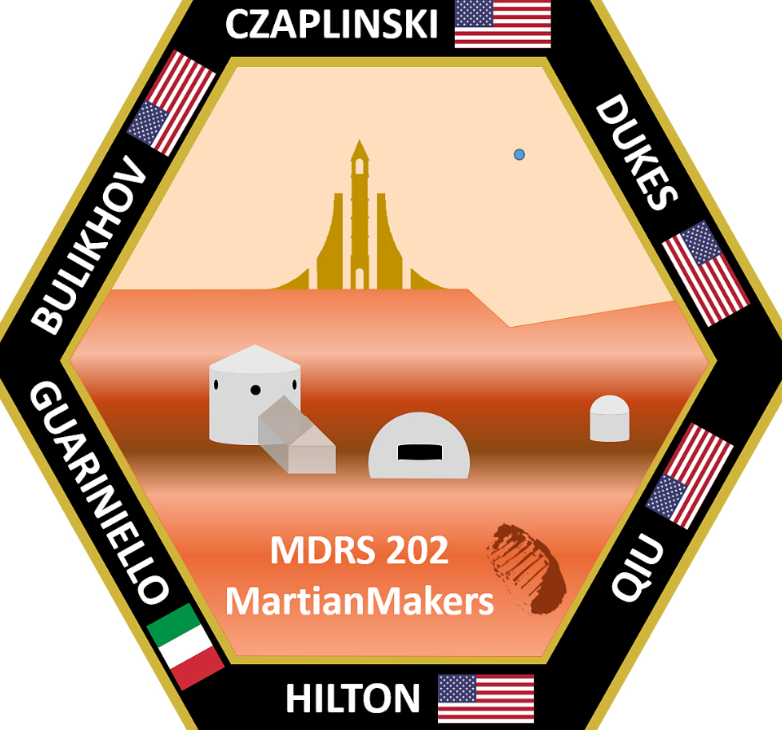 Purdue team completes "Mars mission"
Jake Qiu, a senior in Agricultural and Biological Engineering, served as health and safety officer on the Purdue Mars simulation team at the Mars Desert Research Station facility in Utah from December 30 to January 12. The PK-12 Council is seeking nominations to recognize individuals in the College of Agriculture who demonstrate excellence and impact with PK-12 engagement and outreach activities. 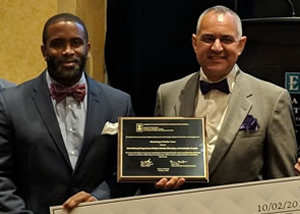 Individuals or teams can be nominated for three PK-12 Outreach and Engagement Awards: Excellence, Staff; Emerging Faculty Impact; and Sustained Faculty Impact. Awardees will receive $5,000 to advance PK-12 efforts. Please nominate yourself, a colleague, or a team by emailing the nomination form to nknobloc@purdue.edu by February 1, 2019. Indrajeet Chaubey, Associate Dean and Director of International Programs in Agriculture, will leave Purdue to become Dean of the College of Agriculture, Health, and Natural Resources at the University of Connecticut, effective March 1, 2019. Suzanne Nielsen, 150th University Professor and Professor of Food Science, is chairing the search advisory committee for the next Associate Dean and Director of International Programs in Agriculture. The following faculty and staff are serving on the search advisory committee: Adrienne Albrecht, IPIA Study Abroad Manager; Gary Burniske, Managing Director of Global Sustainability Initiative; Liz Karcher, Assistant Professor of Animal Sciences; Tes Mengiste, Professor and Associate Department Head of Research in Botany and Plant Pathology; Beth Siple, Assistant Director of Financial Affairs in Agriculture; and Holly Wang, Professor of Agricultural Economics. Because there have been multiple searches for this position very recently, this will be an internal search using the previous position description. This should help the process move along quicker. Applications are due February 4, and the hope is that this search will be completed in March. Hazel Wetzstein, Professor and Head of the Department of Horticulture and Landscape Architecture, will retire, effective August 2019. Under her leadership since 2014, the department has seen an increase in undergraduate majors, the Landscape Architecture program has consistently ranked in the top ten nationally, and exciting initiatives like the renovation and re-design of the Horticulture Garden have begun. 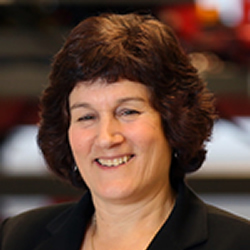 “I am particularly grateful to Hazel for her innovative work to foster a collegial and inclusive climate in her department,” said Dean Karen Plaut. 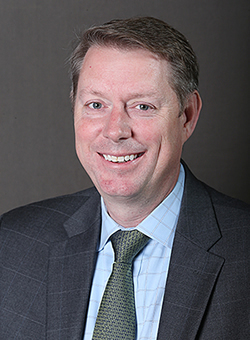 Brian Farkas, Professor and Department Head of Food Science, is chairing the search advisory committee for the new department head. 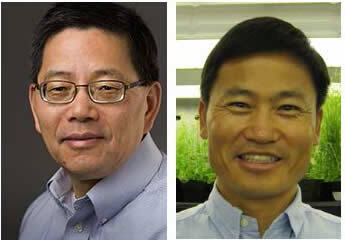 The following faculty, staff and students are serving on the committee: Cale Bigelow, Professor of Horticulture; Bruce Bordelon, Professor of Horticulture; Nathan Deppe, Plant Growth Facilities Manager; Peter Goldsbrough, Professor of Botany and Plant Pathology; Lori Hoagland, Associate Professor of Horticulture; Ying Li, Assistant Professor of Horticulture; Krishna Nemali, Assistant Professor Controlled Environment Agriculture; Sean Rotar, Associate Professor of Landscape Architecture and Program Chair; Fatemeh Sheibani, graduate student in Horticulture and Landscape Architecture; and Ashley Thurman, undergraduate student in Horticulture and Landscape Architecture. Students in Entomology 22810 (Forensic Investigation) learn how to collect scientific data from a variety of crime scenes, including a fatal automobile accident staged behind Smith Hall. Of course, the victim was a mannequin, but the evidence the students collected was real. Photographer Tom Campbell followed the investigators last semester in their quest for evidence. 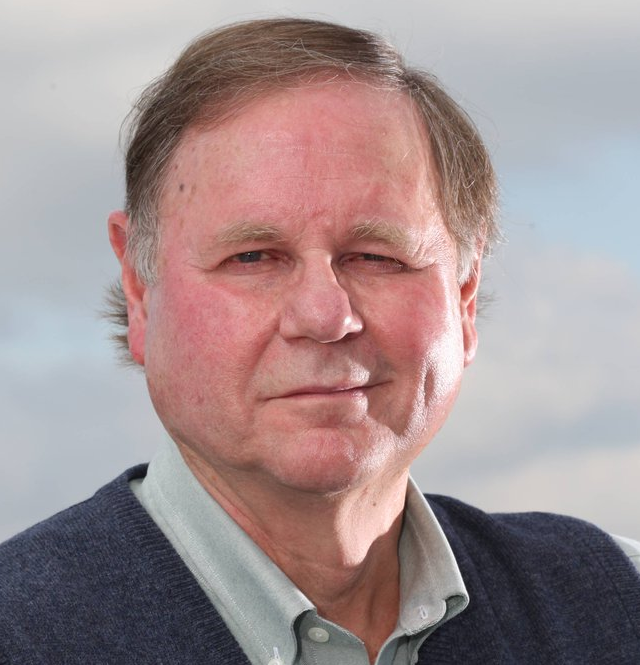 WallyTyner, Agricultural Economics, has been named a Fellow of the Agricultural and Applied Economics Association for outstanding continuous contributions to the profession. He will be recognized as the 2019 AAEA annual meeting in July. Brian Overstreet, Extension Educator in Jasper County, has been named Indiana Certified Crop Adviser of the Year. The award recognizes those have gone above and beyond in their career to help farmers and others in the industry improve crop production techniques. The legalization of industrial hemp in the 2018 Farm Bill is good news for farmers, but there are no pesticides that are considered safe or legal to protect hemp crops. In a paper published in Crop Protection, Purdue Agriculture researchers lay out the problems surrounding the lack of pesticide regulations for cannabis. And in more news about hemp, Indiana’s state chemist, Dr. Bob Waltz, suggests that farmers will need to wait a little longer to begin full-scale grow outs. A gift from the nonprofit Clearing Corporation Charitable Foundation will endow a faculty chair and financially support a variety of student learning opportunities in the Department of Agricultural Economics. 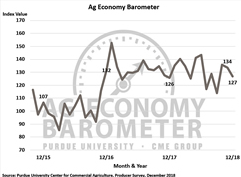 There was a modest drop in agricultural producer sentiment in December as farmers’ perception of both current and future economic conditions weakened, according to results from the Purdue University/CME Group Ag Economy Barometer. 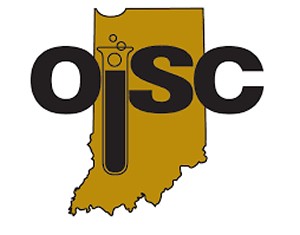 Several upcoming events—the Indiana Green Expo, the Controlled Environment Short Course, and the LandscapeManagement Short Course—will provide landscape, agriculture and green industry professionals the opportunity to network with peers and expand their knowledge base. 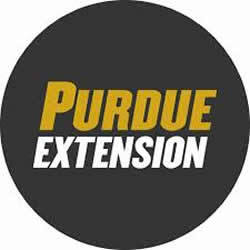 Registration is open for Purdue Extension’s 2019 Indiana Organic Grain Farmer Meeting. 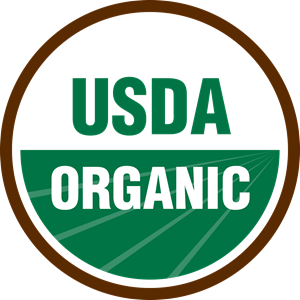 This year’s event has expanded from its annual meeting to a two-day conference and is Indiana’s only conference on organic grain farming. 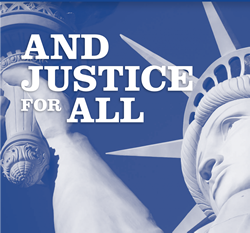 The conference will be held March 6-7 at the Beck AgriculturalCenter. For more dates, deadlines and events, check the Purdue Agriculture calendar. Purdue University hit a milestone in startup creation in 2018 with 223 startups, more than $350 million in funding and investments generated and more than 300 new jobs, officials announced on Jan. 10. Purdue Online Learning and the Office of the Provost are now accepting nominations for the 2019 awards. 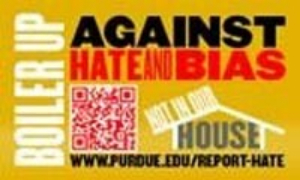 The awards are available to courses and individuals at all of Purdue’s campuses and are open to faculty, instructors or other staff members as individuals or teams. 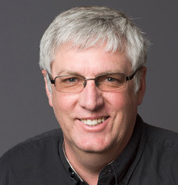 A Purdue Agriculture alumnus is using clean, solar energy to drastically reduce the electric bill for his northern Indiana hog farm with the help of a company based in the Purdue Research Park. A startup based on a Purdue innovation, with funding from the Indiana Soybean Alliance, is using engineering sealant technology to protect and prolong the life of new and existing concrete to make a smoother ride for travelers and save costs for road upkeep and repairs.